With its rugged mountain scenery, beautiful lakes, wooded hills and wild, rolling landscapes, Bulgaria has to be one of the most beautiful countries in Europe… if not the world! So what better destination for a hiking holiday? 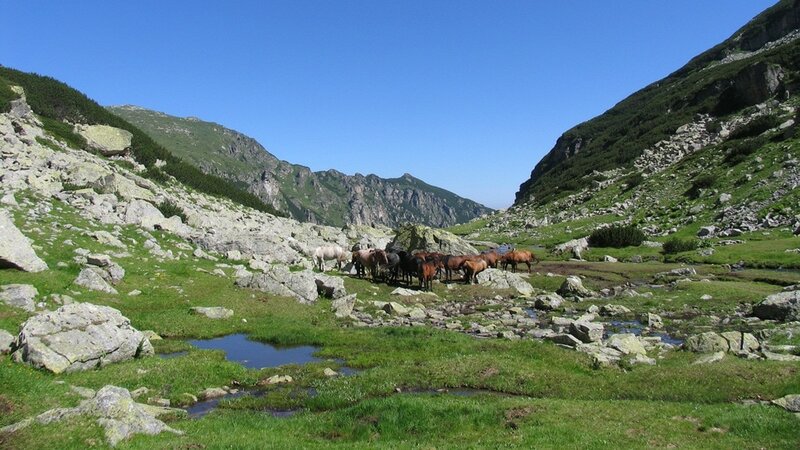 I’ll be glad to help you arrange the perfect, custom-built hiking tour of Bulgaria. With my extensive local knowledge, I’ll be able to tailor a trip to suit the interests and abilities of any group – from challenging treks up to soaring mountain peaks, to gentle rambling through scenic valleys filled with the sound of bubbling streams and the scents of wild garlic, mint and thyme. Why you want me to design your hiking tour? I know all the best hiking routes the country has to offer! You want to experience the mountain huts, but don’t know how to arrange it? No worries, because I can organize it for you. The best sights, the best terrains, the best accommodation and the most delicious local food you can imagine. You can choose between my custom Guided tours, Self-guided tours or just to let me help you with the route. It’s all about you! Bulgaria has more than 200 mountains – including the highest mountain on the Balkan Peninsula – and between this varied range of landscapes you’ll find there’s potential for all kinds of hiking holiday in Bulgaria. Just get in touch with me, and I’ll be glad to help you plan the perfect, personalised break… from scenic walking tours of Bulgaria through to exciting outdoor sports such as hiking, skiing and snowboarding, climbing, kayaking, mountain biking, camping, canoeing and more. Start planning your perfect hiking tour of Bulgaria. Just let me know what do you want to see and I will show it to you. If you still have no exact ideas of where you want to do hiking in Bulgaria, keep reading and find out more about some of the top routes the country has to offer. Rila is among the most renowned mountains on the Balkan Peninsula, featuring its tallest peak Musala, 2,925m high, and comprising a nature park occupying one third of it. Rila abounds in waters. The mountain is crisscrossed by streams and lakes, among which the Seven Rila Lakes locality is simply unmissable for anyone. There is a ropeway to the locality. The lakes, of glacial origin, are located in a circus, and there are both the old chalet and a new one to accommodate tourists. More about hiking in Rila mountains. Pirin bears the name of a Slavic god ruling over thunder and lightning, called Perun. The mountain is bordered by two river valleys, of the Struma and the Mesta. It features Mount Vihren, its tallest, rising to 2,914 m. Most of the mountain comprises the Pirin National park. The Balkan range divides the country in two, running from its west to the east. Its Bulgarian name is translated as “Old Mountain”. From the peak of Vrashka Chuka, on the borderline between Bulgaria and Serbia, to the easternmost point, Cape Emine, on the coast of the Black Sea, the distance is 560 km. There are many good place for hiking for people with different physical condition in all areas. This is the longest hiking trail in Bulgaria connecting the northernmost and the easternmost point entitled “Kom-Emine”. Trekking in the Balkan mountain range. The Rhodopes in southern Bulgaria feature Golyam Perelik, the highest peak, 2,191 m high, and a host of river gorges, caves, karst areas, forests and glades. From the town of Kardzhali, the hike to Perperikon, an ancient site which was built by the Thracians, is especially popular. Transport should be used to the foot of the Perperikon hill. Details about Rhodope mountains trekking custom tours. Тhe easiest hiking trips are to the Vitosha mountain which lies off the capital Sofia. Ropeways lead up the mountain, so another choice can be hiking down. Going up from the different parts of Sofia, tourists can enjoy the forests and the specific formations consisting of large boulders in the Zlatni Mostove (Golden Bridges) area; the formations are also known as the Stone River. More about the hiking itineraries in Vitosha mountain. The relatively low altitude and favorable climate make the Bulgarian mountains attractive for hiking even in the winter. Sometimes winter mountains becomes an arena of hurricane winds, heavy snowfalls, avalanches and temperatures of around -25 / -30 degrees. At other times, however, we’ve seen a bright sun, warm and quiet days even on the highest peaks. Moreover, the winter panoramas are often far more memorable and breathtaking because of the transparency of the cold air. Check out my the winter hiking tours. Hiking in Bulgaria is an experience which brings once-in-a-lifetime delights in nature’s beauty and majesty, soothing verdure, a host of herbs spreading their scent in summer, like thyme and mint. Besides the abundance of verdure, Bulgarian mountains boast towering peaks, refreshing water features: brisk rivers and turquoise lakes, and plenty of trails marked to guide even first time visitors with ease. Rila mountain in Bulgaria is among the most renowned mountains on the Balkan Peninsula, featuring its tallest peak Musala, 2,925m high, and comprising a nature park occupying one third of it. Rila abounds in waters. The Rila mountain is crisscrossed by streams and lakes, among which the Seven Rila Lakes locality is simply unmissable for anyone. There is a ropeway to the locality. The lakes, of glacial origin, are located in a circus, and there are both the old chalet and a new one to accommodate tourists. Another notable spot, a UNESCO site dating back to the tenth century, is the Rila Monastery which can be reached from Sofia. In East Rila, Musala rises with stern grandeur, accompanied by twelve of the eighteen peaks rising over 2,700 m. There is the highest lake on the Balkans territory, Ledeno, and the Borovets resort which features all amenities for vacations. Central Rila boasts the largest glacial lake in the Balkans area, Smradlivo. In Northwest Rila, the Seven Lakes locality attracts both in summer and in winter, and in Southwest Rila the Kapatnik Ridge is the oldest Bulgarian reserve. Welcoming chalets provide tourists with accommodation and unforgettable herb tea. The forests provide shade in summer, and in winter the thick snow is ideal for winter sports. Pirin mountain bears the name of a Slavic god ruling over thunder and lightning, called Perun. The mountain is bordered by two river valleys, of the Struma and the Mesta. It features Mount Vihren, its tallest, rising to 2,914 m. Most of the mountain comprises the Pirin National park. Coniferous woods offer shelter to abundant plants and animals. Among the starting points lying at the foot of the mountain, Bansko deserves separate mentioning, as a famed winter sports resort, in the northeast. From it, the Bunderitsa chalet can be reached in whose vicinity Pirin’s oldest tree, the Baikushev’s Pine, over 1,300 years old, is a spot popular with all hikers. From Bunderitsa the trail leads up to the Vihren chalet, from which the climb to Vihren, Pirin’s tallest peak, starts and takes around two hours. Razlog is another town from where Pirin can be reached; it lies between Pirin and Rila. Sandanski is yet another town from where to start trekking in Bulgaria. North Pirin is the largest part, occupying almost three-fourths, and starts from the Predela locality between Pirin and Rila where resthouses invite for vacations and a ski slope 1,300 m long invites in winter. The Pirin Sings folklore festival is an annual event held in August. The north part features Alpine landscapes, with lakes and shelters, and chalets to offer comfort for hikers, such as the Vihren chalet, at the foot of the namesake peak. In Central Pirin, the smallest part, Orelyak ranks as the highest peak; the chalets are Popovi Livadi and Malina. In south Pirin, ample coniferous and deciduous forests cover the slopes, but there are no chalets. Water features comprise short rivers with a plethora of rapids. The only waterfall, located in North Pirin, near Sandanski, and near the Sandanski chalet, is the Popinolashki, 12 m high. The lakes in Pirin are veritable glacial eyes: they are called the mountain’s eyes in Bulgarian folklore. The Popovo Lake is the largest one. The trails in Pirin are long, and reaching one chalet from the other can take a whole day, as tourists climb to the valley peak, and then start descending towards the bottom of the abutting one towards the new chalet. Rare plants are among Pirin’s merits. Spotting the edelweiss, a protected plant, is great luck. Pines, spruces and firs delight the eye. It should be mentioned that Pirin belongs with the UNESCO list of heritage sites, and was added in 1983. The Balkan range divides the country in two, running from its west to the east. Its Bulgarian name is translated as “Old Mountain”. From the peak of Vrashka Chuka, on the borderline between Bulgaria and Serbia, to the easternmost point, Cape Emine, on the coast of the Black Sea, the distance is 560 km. Hikes are great experiences in all areas, and Bulgarian mountaineers organize hikes from the northernmost point to the easternmost one entitled “Kom-Emine”. The highest peak on the Balkan Range, Botev, rises to 2,376 m. It belongs with the central area of the mountain, comprising the Central Balkan National Park. Trekking towards Botev can start from the town of Karlovo, and on the way there are several chalets. The stern cliffs of the Central Balkan, together with high waterfalls and abundance of vegetation, are worth experiencing. The reserves in this part are nine. The Kozyata Stena is in the Troyan region; it is in the steepest part of the northern slopes of the Balkan Mountains. There, edelweiss can be spotted; the name, meaning “Goat’s Wall”, is derived from the rock formation bearing the same name, and other rocks formations in the reserve also beg to be snapped. Another reserve, Sokolna, can be reached from Skobelevo, a village near Kazanlak, and features the Triglav massif; there tourists can stay at the Sokolna chalet. The hike along the Triglav ridge is a memorable experience. Tsarichina is a reserve near Ribaritsa, in the vicinity of Teteven, and owing to its biosphere is included in a UNESCO programme entitled “Man and Biosphere”. Steneto is a reserve comprising the valley of the Cherni Osam river. It boasts diverse relief. In the Steneto, vertical rocks rise to a height of 150 m. Besides the weird rock formations, caves and crevices in the rocks invite to be explored. The Steneto Gorge, the Kumanitsa cave, one of the longest karst caves in Bulgaria, almost 2,000 m long, and one of the country’s deepest caves, Raichova Dupka, 377 m deep, are notable spots of the reserve. Dzhendema is the largest reserve, around the Tundzha river and comprises the Tuzha chalet; it also belongs with UNESCO’s biosphere programme. But even the lower folds of the Balkan Range offer wonderful opportunities for hikes. From Tvarditsa the Chumerna chalet can be reached, and the hike passes through picturesque forests. From Troyan, the Ambaritsa chalet can be reached, where in winter skiing is rewarding, and in summer verdure and herbs are abundant. It is especially rewarding to start hikes from the small town of Sopot. It is near Karlovo; though there is a ropeway leading up to the slopes from where several chalets can be reached, it is also great to take the path starting from the monastery on the town’s outskirts and follow the river course, and then up the slope, as views unfold around. The eastern part of the Balkan Range also features moderately high localities to which Bulgaria trekking is easy, and a number of archeological sites are easy to get to. When arriving in Shumen, a town abutting a plateau, it is a great choice to start up from the Kyoshkovete Park, up to the ancient fortress on the plateau, and then follow the path to the Bukatsite chalet, a small but charming chalet in a glade from which trails to ancient monasteries in the rocks lead. Under the Bukatsite, on the other side of the slopes, is the village of Osmar, a famed wine production centre. Cape Emine, on the coast of the Black Sea, can be reached from Obzor, and in the vicinity is the Irakli locality, a protected area. From Emine, tourists can follow the trail which links Kom and Emine. Other opportunities for trekking in Bulgaria can be enjoyed from Veliko Turnovo, a town in whose vicinity the Preobrazhenski (Transfiguration) Monastery is unmissable as a spot to visit. The route leads from the main highway and reaches the monastery where the Wheel of Life mural is an ancient work of art. From Sofia, following the Iskar river course, tourists can reach the Iskar Gorge which is amazing. Hiking in Bulgaria can be combined with spa vacations in the towns of Varshets, Voneshta Voda and Shipkovo. Hiking to waterfalls can be implemented from the Ray (Paradise) chalet near Kalofer, where the Raysko Praskalo is the notable waterfall. Other waterfalls are Borov Kamak, near Belogradchik, to which an eco trail leads, and the Etropole Waterfall, near the town of Etropole. The Rhodopes mountains in southern Bulgaria feature Golyam Perelik, the highest peak, 2,191 m high, and a host of river gorges, caves, karst areas, forests and glades. From the town of Kardzhali, the hike to Perperikon, an ancient site which was built by the Thracians, is especially popular. Transport should be used to the foot of the Perperikon hill. From the famed resort of Pamporovo, trekking in Bulgaria and especially to the Snezhanka peak unfolds view on both sides down the mountain. Hikers can start from the town of Chepelare and follow the path to the upper mountain, from where they can head for Pamporovo and over Snezhanka to Smolyan, a typical mountain town, or head north towards the lower folds of the Rhodopes to the village of Hrabrino, in the Plovdiv region. Naturally, hiking from Smolyan and from Hrabrino is also a great choice. During hikes, the abundance of coniferous forests will accompany tourists, and in the western part the vegetation is truly lush. For tourists starting from Smolyan, the Smolyan Lakes just several kilometers from the town are the initial point. In the western Rhodopes, hiking to the Rhodopes’ highest peak, Golyam Perelik, is a must. There are also several other peaks rising to over 2,000 m.
The Chudnite Mostove (Wonderful Bridges) is an impressive ensemble of rock formations, marble bridge like structures, and no one should forget the tradition to write their names with charcoal on the rock after passing over them. Besides Smolyan, Chepelare, and Pamporovo, other towns invite with starting points for hiking. From Bachkovo the monastery of the same name can be reached, and in the vicinity there are waterfalls to which trekking is rewarding. Starting from Trigrad, in the south, where the gorge is especially fascinating, routes lead tourists inside the beauty of the Rhodopes. The easiest hikes are to the Vitosha mountain which lies off the capital Sofia. Ropeways lead up the mountain, so another choice can be hiking down. Going up from the different parts of Sofia, tourists can enjoy the forests and the specific formations consisting of large boulders in the Zlatni Mostove (Golden Bridges) area; the formations are also known as the Stone River. The bus lines are regular, so hikes can be easily implemented. Hikers can start from any part to reach the mountain’s highest peak, Cherni Vrah, 2,290 m high. Besides it, Vitosha has nine other peaks towering to over 2,000 m. Hikers can start from any area of Sofia or village in the vicinity of Vitosha, such as Boyana, Knyazhevo, Dragalevtsi, Simeonovo. From Knyazhevo, the gondola ropeway is the easy way up, but hiking is more pleasing. Hikers can reach the television tower rising on the Vitosha slope. On Cherni Vrah, a meteo station is still in operation, and it also serves as a shelter and café. The chalets abound, ready to offer food and accommodation. Hiking in Bulgaria or to the Bistrishko Branishte reserve or to the Zlatni Mostove enables tourists to enjoy the ample coniferous forests. Bistrishko Branishte is a reserve under UNESCO’s biosphere programme, with unique stone rivers. From Zlatni Mostove, there are two itineraries to Cherni Vrah. Torfeno Branishte is another point to reach for hikers, abounding in shrubs, mosses and algae. Dotting Vitosha are areas with mosses, lichens, forests featuring spruce and firs, and the lower slopes are covered in deciduous forests abounding in beech, birch and aspen. Flowers like lilies and green-winged orchids, east European species, complement the landscape, also lungworth is a common plant in shady areas as it likes dank spots.